Daniel Nathan wrote this novel. So, let’s review: Dora and Meyer Nathan had a son they named Daniel. The attending doctor disapproved, and wrote David on the birth certificate. As an adult, he took on the nom de plume of Frederic Dannay. With his cousin Manfred Bennington Lee (born Manford Lepofsky) he wrote detective novels under the names of Ellery Queen and Barnaby Ross. 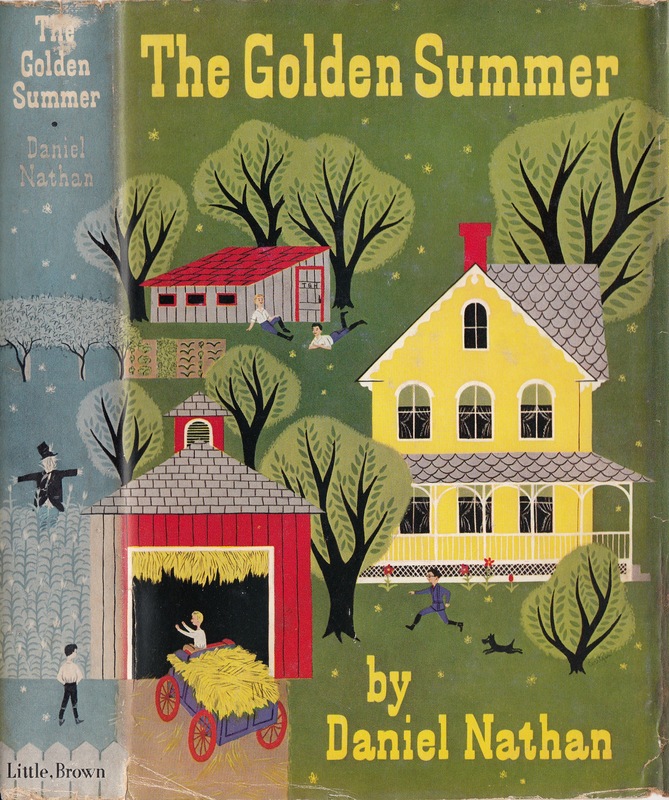 When he decided to write a book about his childhood adventures in Elmira, New York, he took on, or back, the name Daniel Nathan. 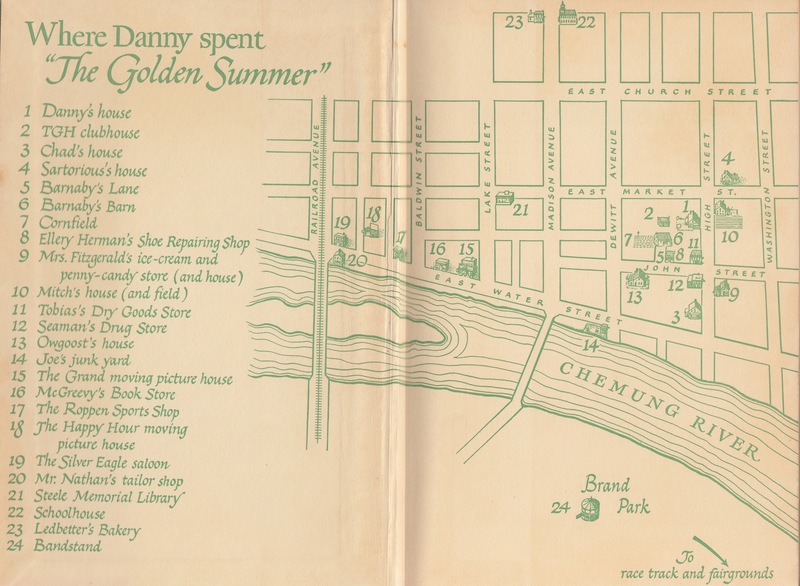 The Golden Summer is nostalgia, but written for middle readers. The book consists of eleven adventures ten-year-old Danny and his friends have one summer, and all involve entrepreneurial activities, hence the title. Several of the stories are solved with help from the Book of Daniel, of Old Testament fame. The adventures are framed within short sections describing the atmosphere of 1913. The book is an interesting and pleasant read, in the same vein as Henry Reed and Homer Price of later decades. which were of similar style, but told as contemporary tales. The book is an interesting relic of a bygone age in that it describes games I remember from my own youth which I am dismayed we ever played. Nathan lists some of the games played at a Boy Scout camp out: mumbl’y peg, leap frog, prisoner’s base, duck-on-a-rock, hostile spy, and baseball. The one I recall with dread is mumbl’y peg. Two boys stood facing each about four feet apart, legs spread wide. Boy one throws a largish (3 or 4 inch) knife between the other’s leg. That boy then moves his right foot to the knife, and takes his turn throwing the knife between his opponent’s legs. The point is to continue throwing the knives into smaller and small openings between the feet. You lose if a) you flinch, or b) your knife hits your opponent’s foot. It helped to wear boots while playing. Great memories, but I won’t be introducing the game to my kids any time soon! Of even more concern is one of Danny’s money-making ideas. He has his tonsils out, and during a check-up appointment a week later, the doctor inspects Danny’s mouth and says he should have his tonsils out. Obviously, the doctor has made a grave error, and Danny decides to tell the doctor that he will tell everyone in town about the error unless he pays him off. Lesson to be learned, kids: Resist extorting people to feel good, like a martyr! The presence of a city cousin definitely cramped Danny’s style. His mother and father laid down the law that Danny must spend all his time with cousin Telford, and since Danny’s friends were completely disdainful of a “city slicker” who never walked around in his bare feet, who was always meticulously attired, and, worst of all, refused sniffily to carry frogs in his pockets – “ ‘fraida warts, the old mollycoddle!” – Danny resigned himself to a temporary curtailment of his normal summer activities. It doesn’t take a stretch of the imagination to realize that “Telford” is Manford, and, also, as in real life, “They bickered almost constantly over who had the right to do this or decide that,” a situation they were cursed with for the rest of their lives. This is the only work either cousin published outside of the detective genre. It is too bad there are not others.